A solo exhibition showcasing the recent work of contemporary Native American painter and muralist Yatika Starr Fields. 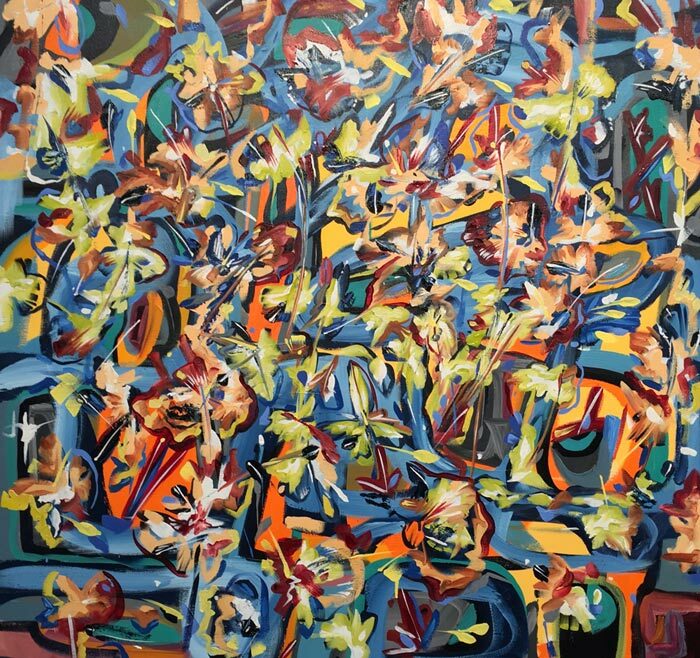 Yatika Starr Fields’ paintings pack a visual punch through intensity of colour and swirling movement. He avoids the linear and perspectival views of much of Western art in favour of an immersive visual field of vivid whirling shapes echoing the vibrancy of life that we see and feel around us. His works have a directness and confidence that produce heightened senses in the viewer, as if on a wild ride through an urban cityscape or plunging deep into the natural world to see it’s underlying strength. Beyond the dazzling effects there is a deeper meaning to these works. Yatika Starr Fields draws on his heritage as a Cherokee, Creek and Osage man immersed in cultural practices from a young age. As a person with Indigenous sensibilities, his Native perspectives are integral to his art in powerful and often understated ways. His pictures are studded with references to tribal traditions, organic forms and aspects of contemporary life. Since his youth Yatika Fields has been the recipient of an impressive number of awards for his art. He attended the Art Institute of Boston where he continued to paint and became involved in the urban graffiti culture. It was during this time that he started working on mural projects and became known for street art. Click here to see more of Yatika’s paintings.